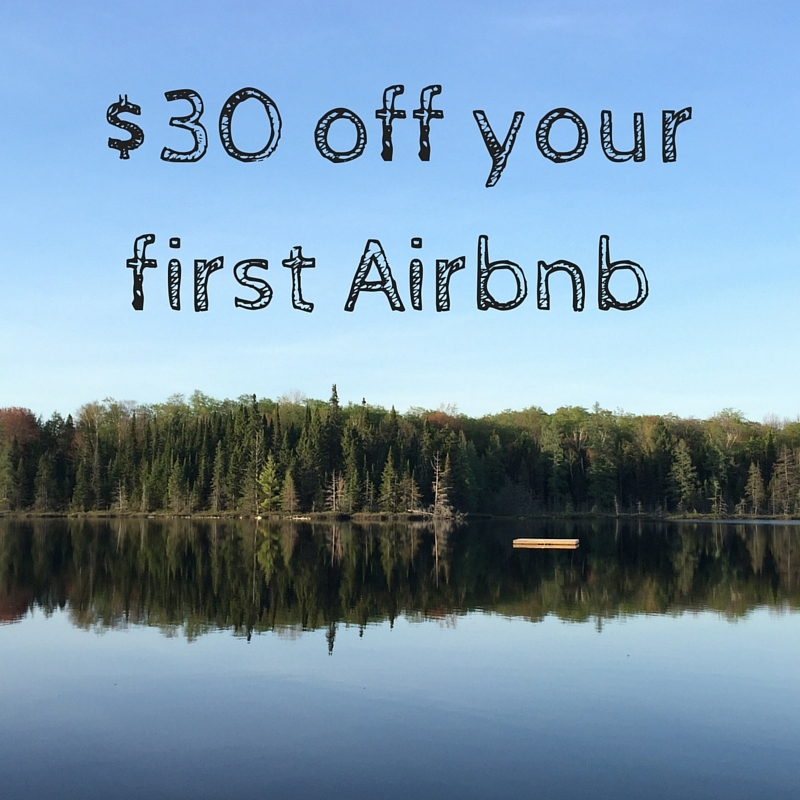 We have had some great experiences in Algonquin Provincial Park, from seeing autumnal colours in 2014, to canoeing and swimming in Canoe and Joe Lakes on a beautifully sunny and warm day in 2015. We’ve also had some challenging experiences such as canoeing all day in torrential wind and rain in 2016. But in all those visits we had yet to see one of Algonquin’s most famous sights – a moose! Three visits to Algonquin, and not one moose. That has to be some record. This year Ontario Parks celebrates its 125th birthday, and with Algonquin being established as the very first park back in 1893, we decided it was time to celebrate by returning to Algonquin and hopefully, at the fourth attempt, seeing our first Algonquin moose! We were granted a pretty view at our Airbnb in Huntsville when we arrived for the weekend. 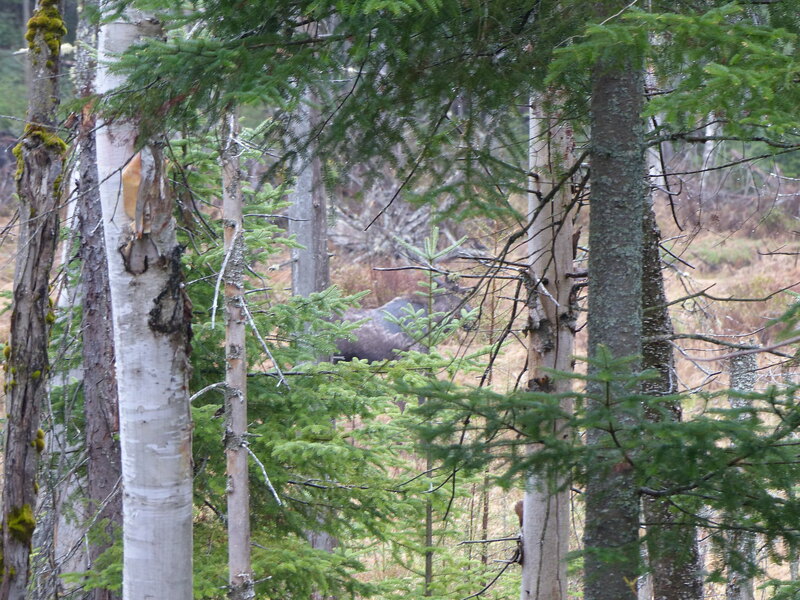 Fortunately, it only took us 24 hours to break our cycle and spot our elusive first Algonquin moose. As we headed home after a day of hiking some of the trails that can be found off Highway 60, we spotted the tell-tale group of cars parked up alongside the road. 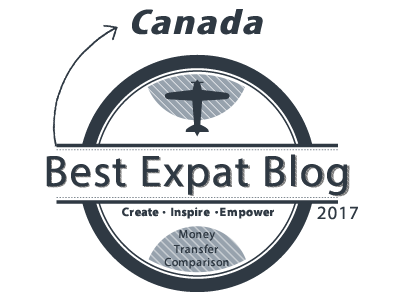 We pulled up and excitedly joined the throng of people on the verge – and there it was, a moose ambling through some boggy ground the other side of some trees. 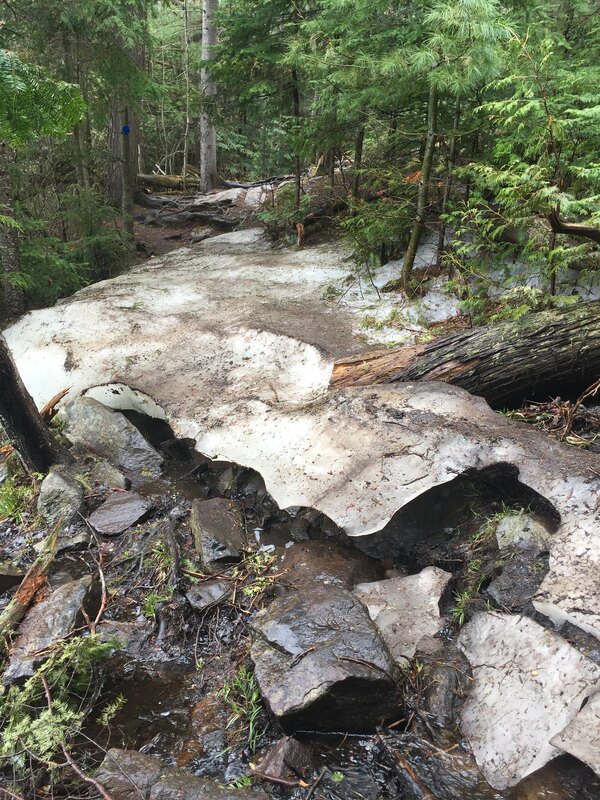 Despite being spring and visiting in May, we still found ice on the ground along one of the trails in Algonquin. We had to put our ice skating skills into practice to get past this! Of course, this was all too simple, and any hope of photographic evidence evaporated when my camera couldn’t focus on anything but the twigs of the trees and the light drizzle. Our first Algonquin moose disappeared into the thick undergrowth on the far side of the bog, and so too did our chances of writing home with a photo as any sort of proof. Feeling a little deflated, we returned to the car, and hit the road. It wasn’t long though until Emma excitedly screamed “moose”, and we pulled over again. Standing on the verge we watched as a moose passed from a small stream and into some dense forest. Other cars came – some slowing down, before then speeding up, clearly unable to spot what we could see. 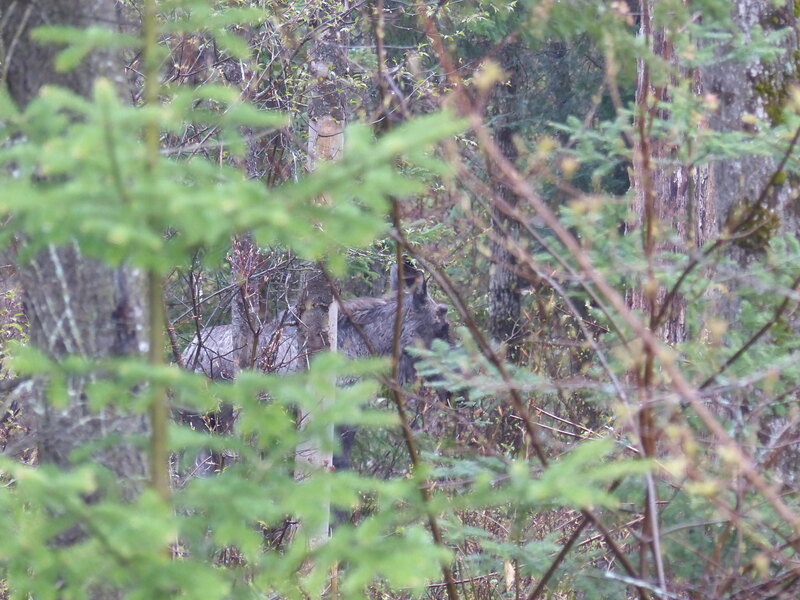 Having failed to get a photo of our first moose, things didn’t get much better when trying to photograph the second moose we saw! With a photo of sorts of this second moose, we returned to the car, only to see in the rear view mirror that another congregation of moose spotters had formed in the distance. So with the moose now coming thick and fast, back we went to join them, and we were glad we did. 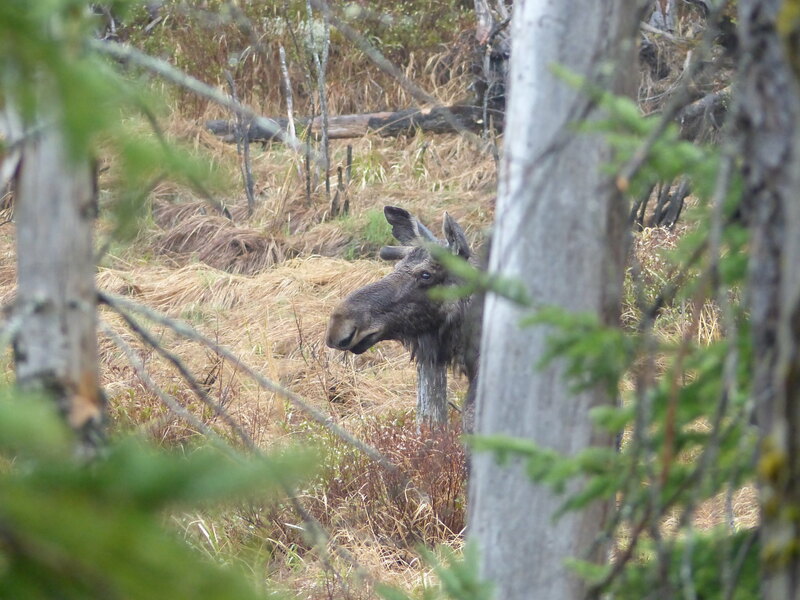 While still partially obscured by the trees, this was the closest and clearest view of a moose in Algonquin that we got, and so we can now finally, tick that experience off the bucket list! Spot the moose! This was our third moose in the space of about 15 minutes!, but initially was also refusing to cooperate for a photo shoot. Ah, at last! A clear view of a moose (well some of it!) in Algonquin Provincial Park! 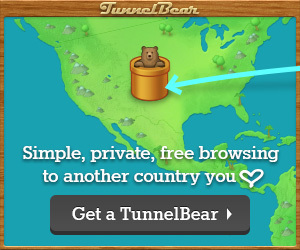 Don’t visit when we do, because we will most likely have scared off any moose. Look out for people stopped along the road. Use your passengers as moose lookouts. Now your driver is free to keep an eye out for not hitting any moose on the road! Have your camera easily accessible for when you stop. Moose tend to appear closer to the end of the day. Spring is apparently a good time to see moose along Highway 60 too, as apparently they emerge from the forest to lick salt off the road after the winter. Are you sure this is not a photoshopped horse?